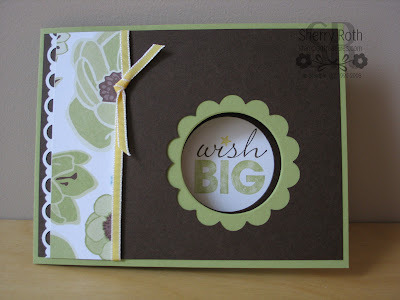 One of my customers and good friends had her birthday at the beginning of August - this is the card I made for her. It actually started from a mistake I had made on another card I was making. There was nothing wrong with the pieces, the hole just wasn't in the right position so I just set these pieces aside. I love how this turned out. This is the inside of the card. I love the colours - taken right from the Greenhouse Gala dsp. 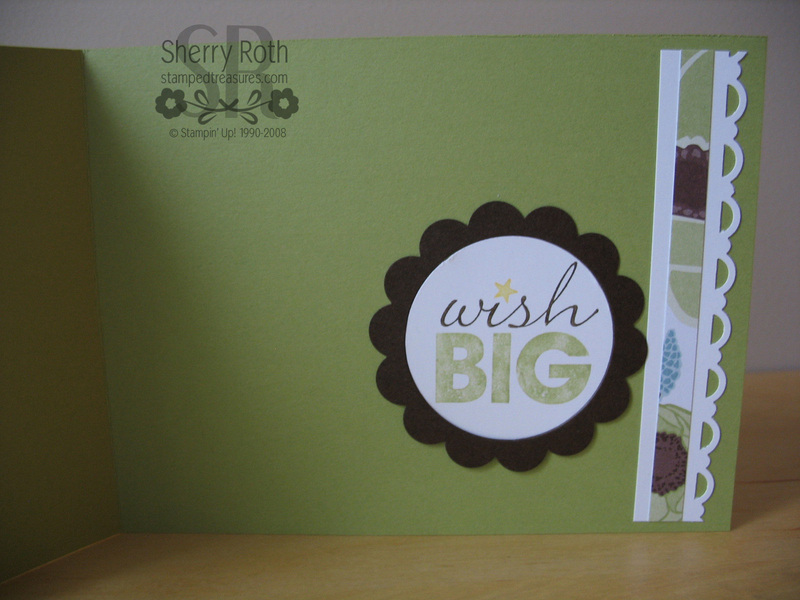 The Wish Big greeting is from the Word Play stamp set. I love it when greetings use a combination of fonts which really is what this set is all about. The rest of the supplies used on this card are listed below. Accessories: Daffodil Delight 1/8" taffeta ribbon (119254); 2-3/8" scallop circle punch (118874); 1-3/4" circle punch (119850); Big Shot die cut machine (113439); Movers & Shapers Curly Label die (114506); Holiday Windows - circle shape on card front (116821).